Despite being fairly new to the industry and a few films old, Bollywood actor Disha Patani has been creating a buzz and has swept the nation with her viral dance moves recreating iconic dance videos and winning the internet over and over again. Apart from being an actor, her social media handles have showcased her interests in fitness and dance encouraging many to join the bandwagon. Disha Patani, who debuted in showbiz with M.S. Dhoni: The Untold Story in 2016, is one of the emerging stars of Bollywood. The actress has earned many accolades and has become a prominent name in the industry in a short span of time with her last outing – Baaghi 2 was a blockbuster hit which went on to mint 150 crores on the box office. Disha Patani's Instagram serves to be a huge inspiration as the actor treats her fans with insights to her workout routine. From hip-hop dance to underwater headstand, Disha Patani has always made fitness look fun and if her new video is anything is to go by, she is not stopping anytime soon. 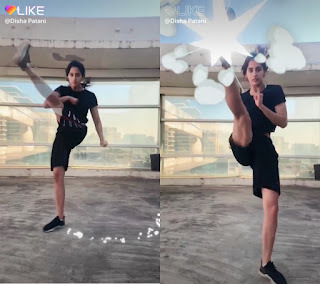 The actress recently shared a video of her high-octane Kung-Fu workout and made it fun by using various LIKE app stickers to participate in the #MagicKungFu challenge. Talking about the video, Disha said, "As a celebrity, I believe that engagement with the audience is important. I have always been a very strong proponent of martial arts and these fun effects on the LIKE app have made my work-out look so much cooler. Looking forward to creating more fun videos on LIKE for my followers."